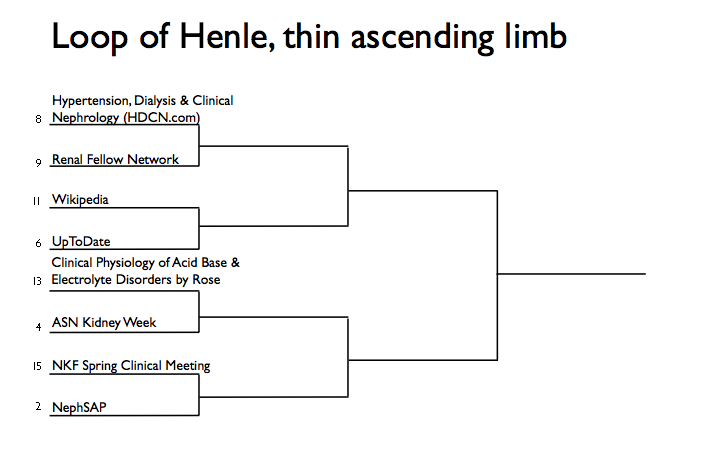 Nephrology Madness: Meet the competitors for Loop of Henle Region’s Thin Ascending Limb Group! Click here to view the entire Loop of Henle Region. HDCN stands for hypertension, dialysis and clinical nephrology. This is a website that hosts many updated nephrology lectures from national, international conferences and the latest articles with links and summaries. It is constantly updated and has been used by many around the world. The content is peer reviewed material with minimal editorial commenting and opinion-based information. Flash slides and audio streaming allow for listening to lectures using multimedia. The website lacks glamor, feels outdated and is not easy to navigate. It requires a subscription to get most of the information that the website hosts. The RPA and ASN endorse this website. Renal Fellow Network (RFN) is the most popular nephrology blog. It was started in 2008 by Nathan Hellman a nephrology fellow at Harvard. Since then, the website has blossomed to be the-go-to site for many fellows in training. It is a blog and the writing is coloquial with opinion based snippets of current updated research in nephrology. In addition, the website offers good board review material, links to conferences and fellow specific grants. Renal Fellow Network was important to nephrology because it ushered nephrology into the online world. Many of the nephrology bloggers currently active online were inspired by RFN and this led to the creation of many teaching sites including eAJKD. It is a well designed website, has many commenting features and endorsements from NKF and ASN. RFN is also unique in that it is run by fellows from around the US and world. This allows for material to be presented by the learner as it is happening. The site promotes networking and exchange of ideas across fellowship programs and countries. Wikipedia stands alone with a first or second in every term but one. Wikipedia is the Michael Phelps of online nephrology answers. 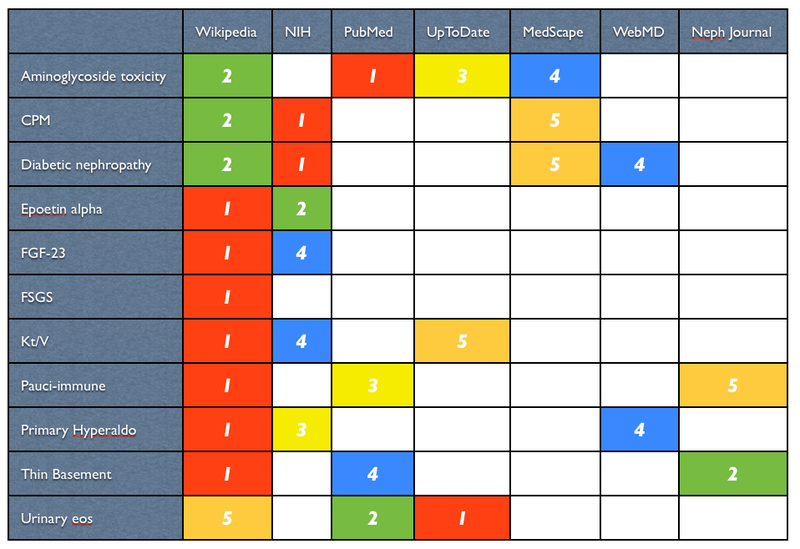 UpToDate is a juggernaut which rewrote the rules of medical publishing. It was the first successful electronic textbook. When textbooks were just thinking about gluing a CD-ROM to the back page as a multi-media extra, Rose had thrown out the whole book and just used the CD-ROM. This allowed him to ship the textbook before it was done. I remember ordering UpToDate in the mid-90s and internal medicine was not even complete. It was almost finished but some specialties were completely absent. However, every 3 months I would get a new CD with updates to the current files, newly written sections and cards and an update to the abstracts of Medline. In the days before PubMed, UpToDate shipped with a copy of index medicus. The other freedom of the CD-ROM, was it allowed an all new editorial style. Instead of doling out strict word limits in order for the textbook to hit the length determined by the marketing department. Rose was able to go into as much detail as he wanted. Completely disruptive. He outflanked all of the internal medicine textbooks and they still haven’t caught up. I was finishing my first month of my first rotation as a third year med student when I asked my resident what I should read to help me understand fluids and electrolytes and he told me to get Burton Rose’s book. This may have been the worst advice ever: 893 pages (excluding the index) of electrolytes. I bought the book and it went on my shelf. The book remained unopened for 2 years. During my internship year I finally started reading it. His straightforward, mechanistic explanations of the physiology made everything logical. The yellow book (4th edition cover) taught me most of what I know about physiology. I don’t think my experience is unique. I have a feeling that lots of nephrologists out there and probably some endocrinologists and critical care doctors understand the body because of the clear, visual prose that is Rose’s gift. Every year the nephrology community arranges coverage, books flights and finishes posters in order to come together at ASN’s Kidney Week. It is a week probably not much different than what the cardiologists and hematologists do. We listen to experts, we show off our work, reunite with colleagues and collaborators. Meet old heros and future partners. Kidney Week is an opportunity to show off the specialty to shiny medical students and exhausted residents delighted to be away from the wards for a week (even if it is Philadelphia in November). Beyond the acres of symposia, we meet with editorial teams, build fellowship curricula and organizational policies. We meet as principal investigators in ongoing longitudinal studies. We get a chance to go beyond the screen and phone and break bread with our extended renal family. National meetings have a way of inspiring and renewing us. ASN’s Kidney Week has woven itself into the very definition of the renal community and nephrologists who don’t go need to reconsider. The NKF sponsors the Spring Clinical Meetings each year. The spirit of the meeting is multidisciplinary and patient centered. The meeting is also friendly to fellows as case reports are always highlighted. It is where the annual national nephrology Fellows’ research competition is held each year. This is a great event pitting fellows across the country against each other. This year’s meeting is April 2-6 at the Walt Disney World Swan and Dolphin Hotel in Orlando, FL. The theme is always patient centered and typically draws nurses, dietitians, physician assistants, nurse practitioners, social workers, technicians and nephrologists. The meeting is small in size and scale and is a great place to touch up on bread and butter skills. The sessions are practical and informative. NephSAP is a popular publication produced by the ASN. The first installment was July 2002 and was on the topic glomerular, vascular, tubulointerstitial and genetic diseases authored by Drs. Appel and Glassock. The great value of NephSAP is that it encapsulates the latest research and information about a particular topic. The series is authored by top physicians/scientists in their respective field. This publication is truly a gem in the field of nephrology and is used by fellows and practicing nephrologists to stay abreast of the ever growing field. Got bracket fever? 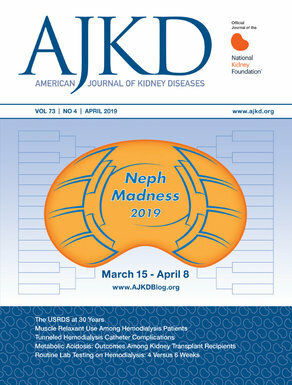 Click here for the latest on Nephrology Madness! Although I agree with the ease of wikipedia there is still no comparison to the depth that uptodate has to offer. And that it was started by a nephrologist is even better!